River students began this unit of study looking at the painting titled Cat and Bird by the artist Paul Klee. Then, using black oil pastel and following a line directed drawing lesson, each student drew a cat in a similar style to the cat in the painting. Students also drew a small image in their cat's forehead to let us know what their cat was dreaming about. In the next class we read the book titled The Cat and the Bird A Children’s Book Inspired by Paul Klee written by Géraldine Elschner and illustrated by Peggy Nille. The story explained why the cat in Paul’s painting was thinking of a bird. Next, the students used chalk pastel to add color to their cat drawings. The final step involved adding whiskers using the black oil pastel and retracing the original oil pastel lines. Begin by drawing an eye anywhere on the page using a black sharpie marker. Now start adding to your drawing to create a monster. Let the monster emerge as you draw. If you feel that you have made a mistake, turn that mistake into a part of your monster. Once you have the outline of your monster body, use an extra fine point sharpie marker to add details to your monster. 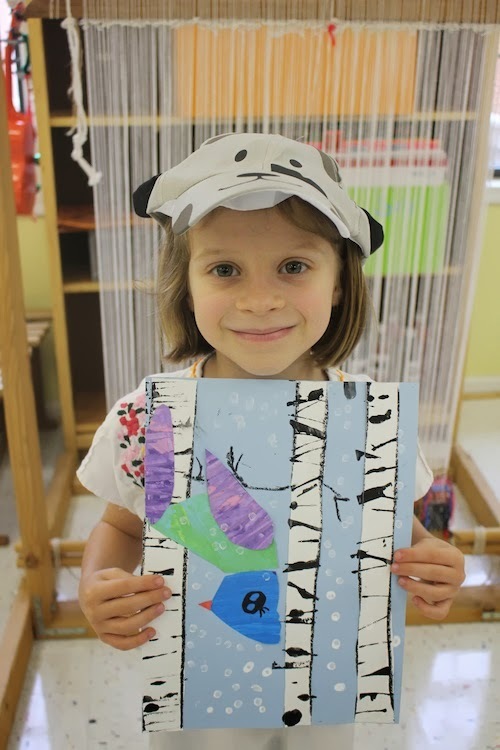 This year's Lower School Art Show will happen in conjunction with Grandparents' and Family Friends' Day on March 28th. Natasha could use some parental help in preparation for this show. She needs 4 parent volunteers to help hang the art show on the afternoon of Wednesday, March 26, starting at 1:00, and 2 or 3 volunteers to help take the show down on Monday afternoon, April 14th starting at 2:00. Please e-mail Natasha directly at nshannon@cfsnc.org if you are able to help out on either of these days.